The Ultimate Sectioner: Precise. Flexible. Reliable. The “Porter-Blum” MT-2B UltraMicrotome gives you exactly what you’re looking for in a sectioning instrument. You want precision because electron microscopy demands it. You want consistency and repeatability, non-uniform sections can’t be interpreted properly. You want both automatic and manual operation because automatic sectioning speeds routine work and manual operation lets you devote extra care to particularly difficult specimens. And you want an instrument that’s reliable because repairs waste lime. These are some of the reasons why you should consider buying an MT-2B over any other microtome. It gives you what you want at a reasonable price. But don’t take our word for it. Ask any microtomist who owns one. He’ll tell you how he obtains outstanding results with the MT-2B for either electron or light microscopy. You know exactly what the section thickness will be every time. 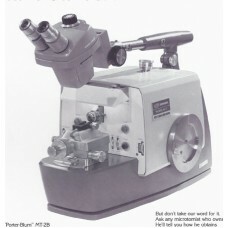 The MT-2B is one of the most accurate UltraMicrotome ever developed. That’s because it uses a mechanical advance system to advance the specimen toward the knife. Specimen advance is accomplished by rotating a drive screw. A system of levers advances the block precisely and reproducibly to insure uniform section thickness. On the MT-2B section thickness is completely controlled by the mechanical advance system. You may turn the instrument on and off a hundred times; it has no effect on section thickness. Additionally, because the cuffing arm on the MT-2B is always at room temperature, it is almost insensitive to drafts or air currents. You can cut hard materials and large block faces. Not only are you able to section biological tissue with the MT-2B, you can section just about anything, including hard materials such as bone and many metals. And you can section large block faces as well, up to several millimeters wide and long, depending on block material. The instrument’s driven cutting stroke makes this possible. It “drives” the specimen past the knife, rather than using gravity alone to provide the cutting force. You never have to worry about stalls. Thanks to the MT-2B driven cuffing stroke, you know you’re getting a constant, uniform cutting speed. This means that you will not have to worry about having inferior sections caused by the cutting arm slowing down. Also, stalling which can ruin a costly diamond knife is virtually impossible on the MT-2B. You get total operating flexibility. The MT-2B is one of the most versatile instruments of its kind. You can set it to operate in one of three ways — automatic or motor driven, manual or hand driven, or a combination of the two. The AUTOMATIC mode gives you continuous automatic ultra-thin sectioning. Just set it and the MT-2B will continuously advance for section thickness from 1 nm to 4μm. You get the same continuous automatic sectioning in the SEMI AUTOMATIC mode, but you control the sectioning thickness by advancing the stage. The MANUAL mode allows you to operate the MT-2B entirely by hand for complete sectioning flexibility. You dial the speed you want. You get cuffing speeds from 0.09 to 3.2 mm per second and you can vary the speed anywhere within that range. You can set the MT-2B to section at the perfect speed for your sample. You can alternate thin/thick sectioning. There may be occasions when you want to cut a thin section, then switch to a thick one for survey sectioning or evaluation with a light microscope. With the MT-2B, you simply push a BY-PASS button and the specimen automatically retracts from the knife. When the specimen advances the distance you want, you release the button and make your thick section. The specimen holder is mounted on the end of the cantilever arm (to the left in the diagram), and moves up and down with the cantilever arm, which is connected to the pivot arm through Pivot A. The pivot arm is connected to the frame of the microtome through Pivot B. The lower end of the pivot arm rests on the lead screw, which rotates a fraction of a turn with each cycle of the microtome mechanism. This rotation of the lead screw (arrow 1 in the diagram) moves the lower end of the pivot arm toward the rear of the microtome (arrow 2). The upper end of the pivot arm moves forward (arrow 3) and advances the cantilever arm (arrow 4). The magnitude of this advance depends both on the amount of rotation of the lead screw and on the ratio of the spacing (d) between the two pivots to the distance (D) between Pivot B and the lead screw. The spacing between the two pivots (d) is determined by the setting of the pivot control, on the top of the pivot arm.